Do your teeth suffer from minor cracks or imperfections, such as chipping or cracked teeth? If so, composite bonding may be something you should consider. Composite Bonding is a procedure which involves filling the gaps or imperfections in your teeth with a tooth colored material. This material is resin based ( we use non-BPA composite ) and has sufficient tensile strength to survive everyday wear and tear. It is the least invasive cosmetic dental procedure, and can easily fix imperfections in the misshaped, discolored and decayed teeth. A minimal amount of tooth removal is required, and the use of anesthesia is not mandatory for this procedure. Your dentist will first determine the color of your teeth using a shade guide to make sure that the composite material blends in. After the appropriate shade is selected, the tooth that is being operated on is conditioned with adhesive , to help the composite stick to the damaged site. The preliminaries are followed by the application of the resin based composite, which is runny initially. The dentist molds the material according to the required shape, after which it is exposed to an visible blue light to harden the material. 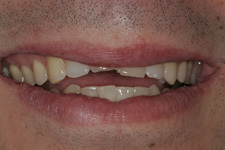 The procedure is concluded with the dentist shaping and trimming the composite to ensure continuity in the teeth. The procedure takes around an hour to complete on average. In some cases, it may require more time if there are multiple teeth involved. Bonding is also one of the least expensive dental procedures available today. The main advantage of composite bonding is the simplicity of the whole procedure, requiring just one office visit in most cases. Also, as compared to porcelain veneers which require larger amount of tooth to be removed, composite filling can be done without drilling too much of the tooth, causing little to no pain. Anesthetics aren’t required for most cases, which are more comfortable and less risky of anesthesia complications to a patient. This is why doctors prefer this method for small cosmetic changes, due to the relatively low invasiveness of the procedure, which also lowers the risk of an infection. 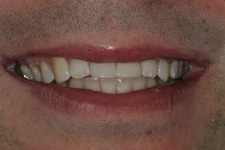 Not to mention the fact that composite bonds look completely natural and are easy to repair. Though composite bonding may be the preferred method for rectifying small imperfections, they aren’t suitable if a substantial amount of the tooth is damaged. Also, the material may last long time, but can be damaged if the patient suffers from poor eating habits. As a general precaution, nail biting and hard objects should be avoided. Is It the Ideal Treatment for You? If you suffer from small imperfections such as a crooked, decayed or cracked tooth, composite bonding may be the ideal procedure. Bonding can also be used to extend the length of the teeth, or if you suffer from uneven bite pressures in different areas. However, it is best to consult an experienced dentist beforehand, who can guide you to choose the right material for your specific mouth condition.